This Collection, envisioned by Kelly Brown, the world class icon of this genre, is the first dedicated range of its kind. Newborn photography has become one of the most relevant discipline in the industry, bringing in a brand new breed of lively, creative photographers capable of inspiring millions of families by capturing amazing portraits of their children. Kelly Brown has built her entire career upon outstanding quality and attention to details. 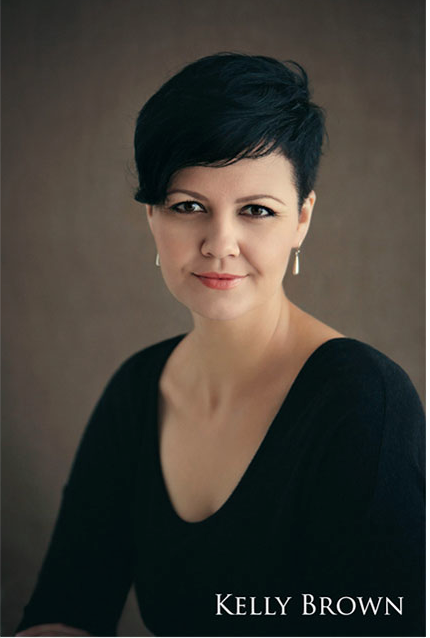 Thanks to her incredible experience and solid technical background Kelly has given a new pulse to newborn photography, demonstrating how to obtain the same perceived value of, for instance, fashion photography through composition, artistic vision, design, postproduction and education. Graphistudio is proud to partner with such a great player and shape a delicate, comprehensive, amazing range of products to celebrate life in its pure essence: our children. The perfect blend of first class materials, innovative design and timeless quality. A full range of products to create your perfect package or your à la carte offer. Lovely colors, soft touch organic surfaces, stunning HD printing technology. Favola is handmade with love and is the Italian word for “fable”, because our children deserve a great story where magic meets reality and maternal love will protect them forever. Everything in Favola is designed to give a vintage feeling, to transcend time and trends. The luxury leather wrap protects the album, which is hand-bound and hand-made with cotton paper; the magical look and feel are a result of the organic materials that glorify newborn photography. SIZE: 15X12″ PAPER: Pure cotton Amalfi paper, with deckle edges. BINDING AND PAGES: Japanese, min 10 max 40 pages. Flushmount min. 10 max 20 pages. COVER: Genuine Italian cowhide leather “Etrusco” with inside cover in Suede. Leather The full grain “Etrusco” leather is exclusive for the Kelly Brown Collection. The rich texture, soft surface combined with the high quality cowhide is made in Tuscany (Italy) and features a natural tanning process along with a manual staining that ensures that each piece is truly unique. Paper Favola is the first album featuring handmade limited edition Amalfi paper. The deckled edge is created using the same ancient paper making process, very much the same workflow still used in the family owned paper mill in Amalfi (Italy). Made with 100% cotton fiber, smooth surface. Contessa means Countess in Italian. It’s a tribute paid by Kelly Brown to the last master of our amazing Castle Ceconi, the iconic venue where Graphistudio hosts worskhops and round tables with photographers from all over the world. Contessa represents the fifth essence of the Matted Album, featuring HD printing, solid oak wood cover, real Italian leather spine. SIZE: 13X9.5″ PRINT: CANON DREAMLABO HD PRINT FINE ART. BINDING AND PAGES: Lay Flat, white Tintoretto bevel mat, with thick white core. Min 10, max 20 pages. COVER: Wood front panel Sequoia leather spine & back. Leather Full grain “Sequoia” leather. Rich texture, natural look, warm feeling. Sequoia looks like a distressed surface aged by time, creating a vintage look and feel. One of the most popular choice among our clients, it’s perfect for this classic product. Matted pages Contessa features our unique Matted Album binding, with high precision bevel cut and HD printing technology. The best in terms of durability and color gamut. Available from 10 up to 20 thick pages. This is the ideal solution for your maternity/newborn sessions, a box where you can store from 10 to 20 matted pictures. Showcase is handmade in solid oak wood, in two different finishing, the classic “shabby white” and the vintage “decapè”. 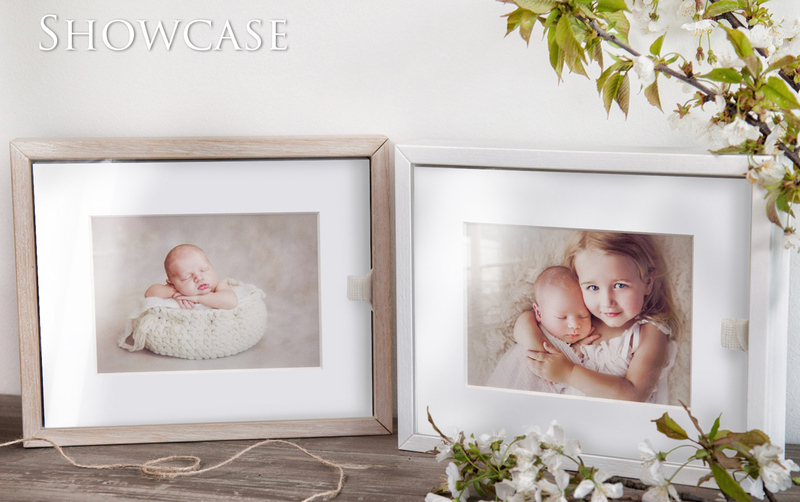 The sliding acrylic lid protects the pictures and transforms the box into a standing frame to be displayed in your clients’ homes. BOX SIZES: 8X10″ or 11X14″ BOX CAPACITY: To hold 10 or 20 mats in regular thickness. BOX MATERIAL: Wood shabby or decapé, with acrylic lid. RIBBON: Sateen (28 colors). Wood Unlike any stock product, Showcase are hand made one by one, as everything else at Graphistudio. Made of solid oak wood, this box looks solid and substancial; the perceived quality is much higher than imitations or cheap items available on the web. Even the simple sliding lid is cut with micrometric precision, assuring a perfect, smooth closure. Mats and prints Our mats feature a bevel cut (45°) and 3mm (1/8 inch) thickness, certified archival therefore compatible with fine art products. Prints available in this range are performed by Canon Dreamlabo™, HD ink jet technology, for wider color gamut and unparalleled quality over time. Paper range goes from Fine art, Deep Matte Touch, Lustre to Glossy finishing. Photography is about capturing light and telling a story. Looking at things from this angle we might say that newborn photography tells the very first chapter of everyone’s story. Storia (Italian word for story) has been designed to bound together the unique pictures of babies’ first days, creating a series of volumes ideal for the classic trilogy “maternity – newborn – first year”. SLIP-IN MATS BOOK: Size 8×10″ – 10×8″, from 6 to max 12 bound slip-in mats, with black or white lux linings and hard back cover in Suede. SLEEVE: Size 8.5×11.5″ or 11.5×8.5″, Wood Fiber with hidden magnets to align and lock multiple box together. OPTIONS: Storia is also available without the prints. Suede cover Suede represents the perfect mix between the nobility of leather and the versatility of cloth. It’s a microfiber that earned huge success both in the fashion industry and design. Extremely soft and resistant, it perfectly suits each curve and fold of the object it covers, while remaining smooth and close-fitting. Book and sleeve The book is a slip in mats binder, from 6 to 12 pages (sides) with hard back cover and square spine. The sleeve of Storia hides a little feature: magnets are merged into the structure and can keep tightly together two or more volumes! Wrap up with a white shabby wood fibre finishing, the sleeve is tailor made on the book size. The crossover product that ties together digital and prints. Ideal for those services where clients ask for digital files only but professional photograhers are willing to educate on the value of prints. The best of both worlds, Jewelbox is a flexible all-in-one box, affordable but yet unique. The hinged lid features an acrylic window to showcase amazing pictures. BOX SIZE: Size 8×8″ to hold 5×7″ or 7×5″ prints. CAPACITY: To hold up to 50 prints or less using spacers. BOX MATERIALS: Cloud leatherette, with a transparent lid. RIBBON: Sateen (28 colors). PRINT SIZES: 5×7″, 7×5″. PRINT PAPERS: CANON DREAMLABO HD PRINT Glossy, Lustre, Deep Matte Touch, Fine Art. OPTIONS: The jewelbox is also available without the prints and/or the USB drive. Cloud Leatherette Probably one of our best sellers ever, this high quality leatherette offers stunning colors and a soft look and feel. The leather-like texture means high perceived value at a fraction of the cost, ensuring customer satisfaction while consistently supporting your brand as a professional Studio. Prints and USB pen Prints available in this range are performed by Canon Dreamlabo™, HD ink jet technology, for wider color gamut and unparalleled quality over time. Papers range from Fine Art to Deep Matte Touch through Lustre and Glossy finishing. A magnetic USB pen, customisable, completes the package. The entry level in the Kelly Brown Collection, Scatolina (Italian word for little box) holds a USB pen in a nice, handmade box. The invisible magnetic closure cliks softly, showing the upper side of the lid easily customizable by overpinting logos, names etc. BOX SIZE: 4.5×3.5×1.25″ BOX MATERIALS: Linen Fabric. LOCK SYSTEM: Magnetic. USB MATERIALS: Standard Leatherette, Linen Fabric. USB CAPACITY: 4GB, 8GB, 16GB, 32GB, 64GB. OPTIONS: Scatolina is also available without the USB drive. Natural Linen Four pastel colors linen adorns Scatolina, providing the organic look and feel so popular among young generations. A subtle connection to tangible things, balancing the digital stream.